I’ve always had a personal affinity for portfolios with an equal weighting of diverse assets, as they tend to focus less on optimization and more on diversification. The Permanent Portfolio is one good example, and I’ve now added two more to the list: the Ivy Portfolio and the Bernstein Portfolio. Anyone who has read the book will note that Faber also recommended timing strategies to boost returns, but one should note that for comparison purposes I have stuck to simple annual rebalancing. Even then, the results are quite impressive. The relatively low volatility and a long-term CAGR over 6% are both nice features of the Ivy Portfolio. 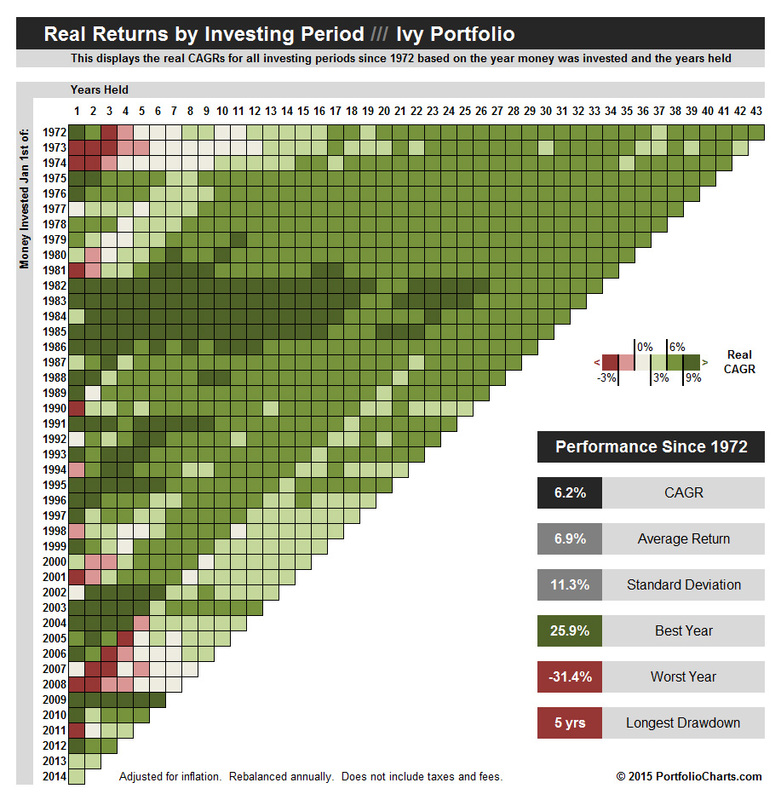 And with a longest drawdown of only 5 years, it has shown remarkably consistent returns over the years. It’s a good example of broad diversification at work. 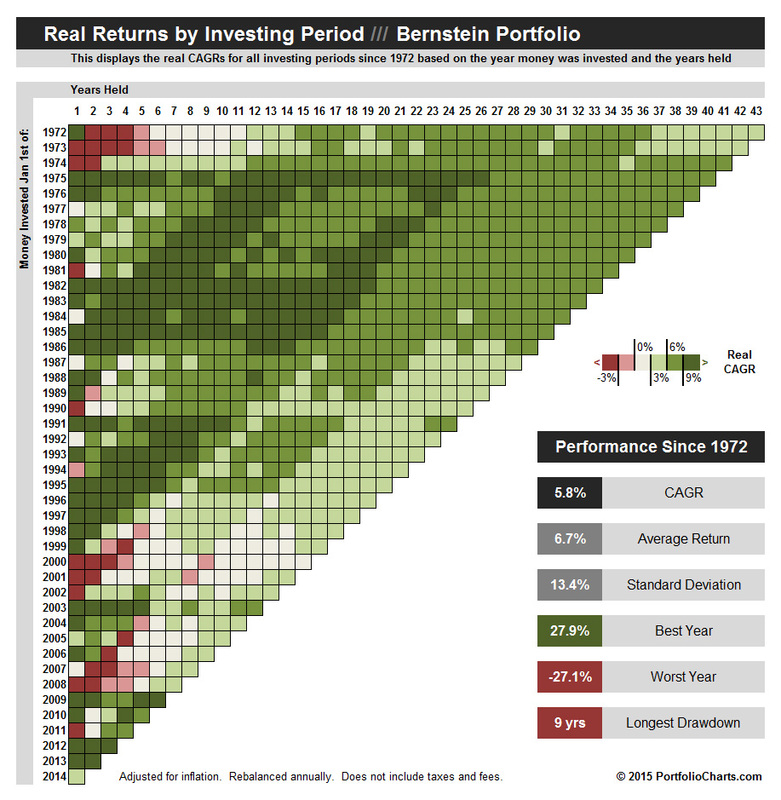 The Bernstein portfolio shares a lot of performance similarities with the 60-40 Bogleheads portfolio, with the stock portion further diversified between small and international stocks for an extra boost. The short term treasuries instead of the total bond market provides a little additional stability in down years with very similar returns. While not as diverse as other options (it’s still 75% stocks), it could be a nice choice for investors who prefer stocks for the long run. Check them both out in the portfolios section, compare them to other example portfolios, and maybe even fire up the calculators to study the effect of tweaking the assets a little. Perhaps one of these portfolios will be just the thing you’ve been looking for. Or maybe the concept of weighting assets equally to maximize diversification rather than optimizing percentages for maximum performance will inspire you to find a well-balanced portfolio of your own.